Low vibration is achieved by the special design of double piston mechanism. New adoption of piston rings minimized power loss and improved cutting efficiency. Longer piston stroke improved cutting speed so much. Rear exhaust system for chip-scattering-free operation. New double-lock throttle lever prevents unintended. 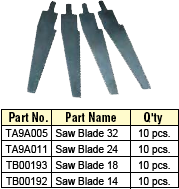 Saw Blade 32 : 2 pcs. Hex. Socket Screw Key 3 : 1 pc.